As some might remember from last year - our slip way was damaged by the 2013/14 winter storms. When we came back to the island in March 2014 a huge hole in our slip way greeted us. This was remedied quickly but the cause for the hole was only discovered during the repair works: The sea wall had been undercut and the wave action had "sucked out" the concrete and gravel. Now, one year later, Chris Ward's team is back to repair our sea wall. Last week the repairs began and it was quite exciting to watch the unloading of diggers and other equipment from the landing craft. Of course we were a bit worried how the wildlife would react to so much noise and all the strange machinery but we needn't have worried ourselves. The Razorbills were watching from the cliffs and the seals were so curious they came muzzling the boat. Of course too much curiosity may be bad for the cat/seal and the work will still need to be done by the time the birds start breeding. Unfortunately private landing on the beach will not be possible until the work is finished. 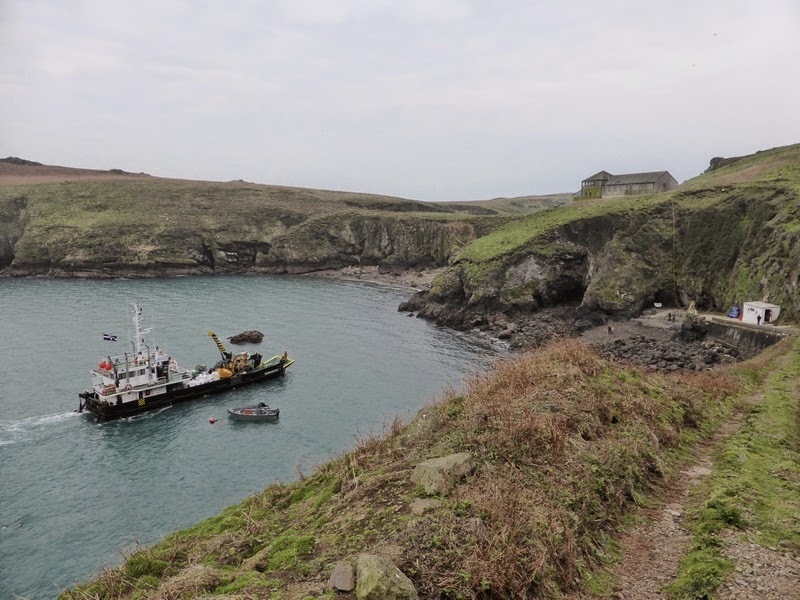 The Dale Princess will be running from 1 April (weather permitting) so exploring Skomer will not be hindered by the building project. 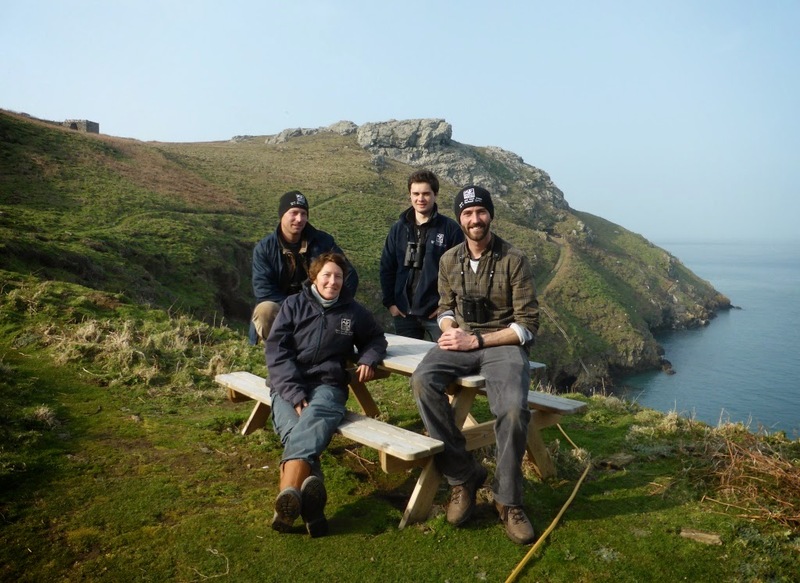 A new year on Skomer Island and we have a new Visitor Officer, or VO. Leighton Newman joins us officially from mid April onwards and will be in charge of the hostel at the farm as well as most aspects of any visitors experience on the island. Leighton had been working as a Field Assistant for the Wildlife Trust at our head office and new visitor facility at Parc Slip. 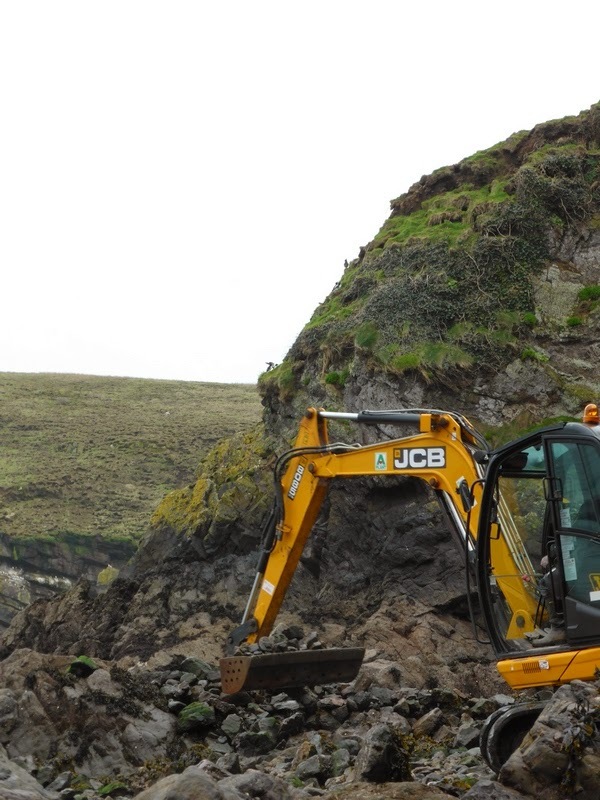 He had already been drafted in to the Skomer team to help cover the period from the beginning of March to mid April and had impressed us so much that we decided to keep him on. 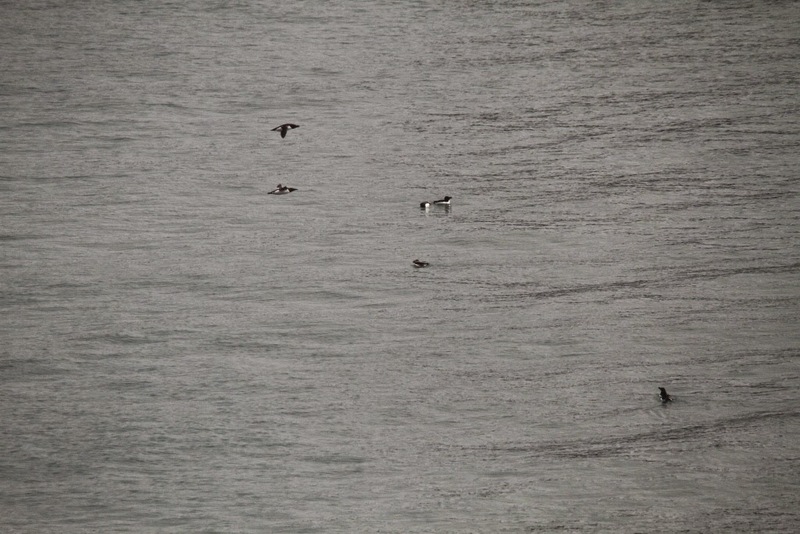 In other news, the first Puffins of the year have been seen today! The cliffs are already quite noisy with the calls of Guillemots and Razorbills and mating has been observed in both species already. The first Linnet of the spring was seen this morning and both Marsh and Hen Harriers have been seen today. 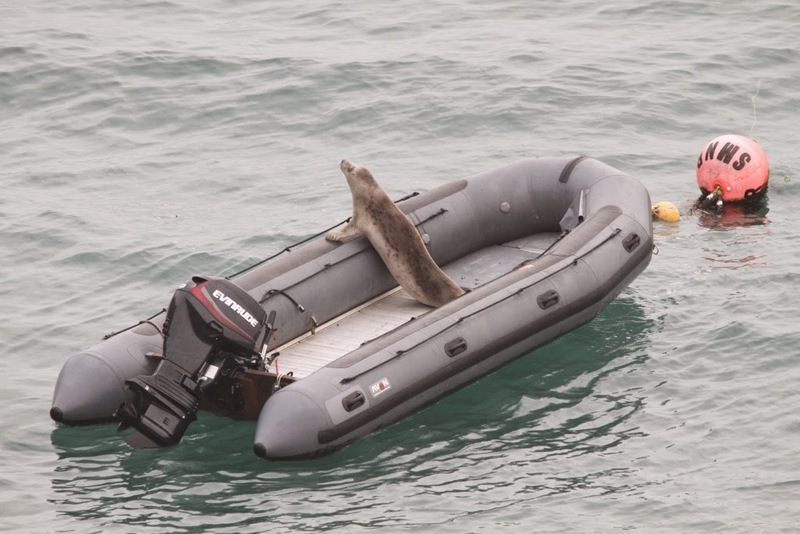 There was also another cheeky seal in our boat this morning! Four days in and all is well on Skomer Island. However, the closer we look, the more signs of wear and tear we find, giving some hint of what the winter just passed was like. Roofs ripped from research hides, mould covering walls, pipe insulation devoured by mice and bird droppings throughout the hostel interior (an upstairs window had somehow blown open), and it's clear to see that all was not quiet while we were gone. However no lasting damage, and nothing that cant be fixed/replaced/scrubbed! 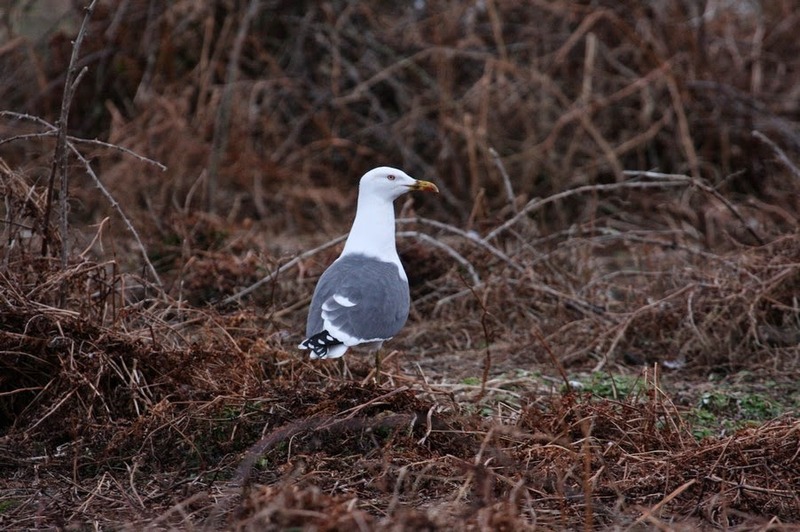 Just as we thought the island had faired well over the winter we find this at Bull Hole! One pellet contained the remains of two Bank Voles/'Skomer' Voles, one Field Vole and a Common Shrew. While the Bank/'Skomer' Vole and the Common Shrew are known to occur naturally on the island, the Field Vole is not native here, and was presumably caught on the mainland, showing that this Short-eared Owl has been passing between the island and the mainland to hunt and potentially roost. Short-eared Owl pellet before dissection. From left to right, Bank Vole, Field Vole, Bank Vole, Common Shrew, only two of which occur on Skomer. Note the red tips to the teeth on the Common Shrew. The 6th saw a Jack Snipe flushed near South Pond, this being a classic spot on the island for this species. This area also produced 12 Common Snipe. 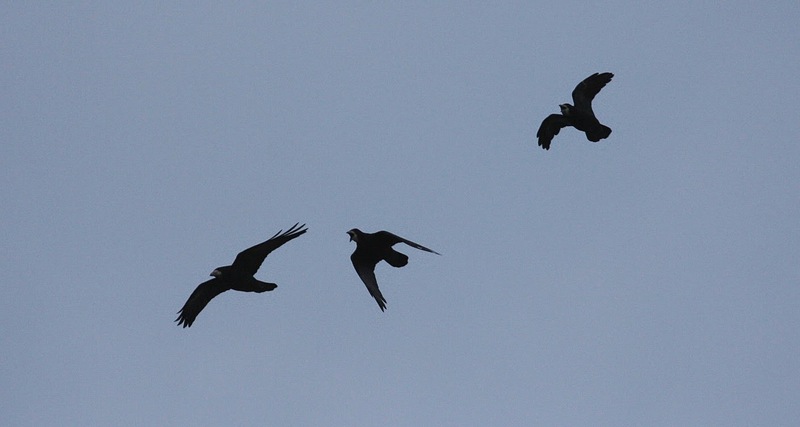 The day also saw our first Rooks of the season fly over, while our first frog and toad spawn of the year was seen at Moorey Mere. The 7th saw three further species added to the year list with a male Grey Wagtail on the main farm track, a pair of Shoveler on North Pond and the returning male Pied Wagtail at the Farm. 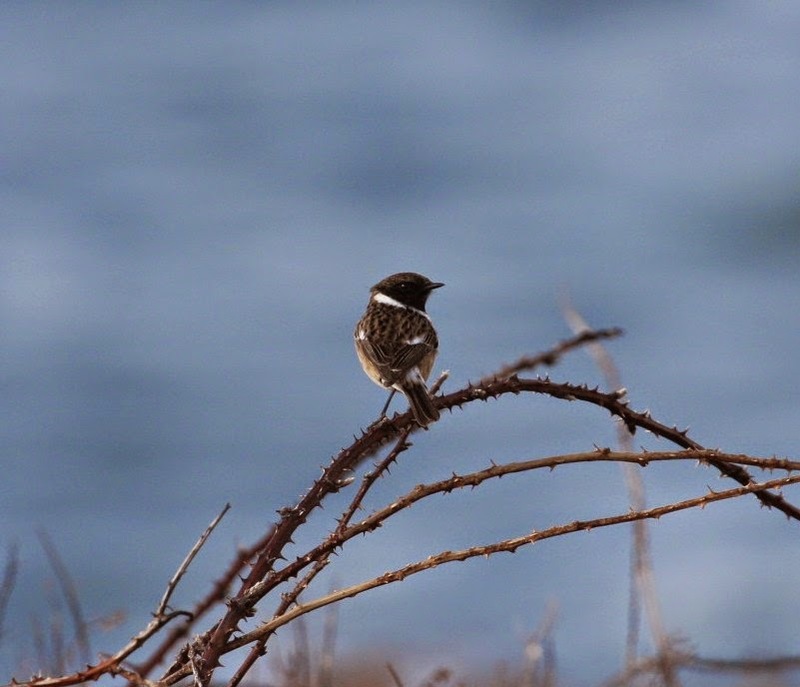 Birds of prey were the main talking point on the 8th, with two Merlin, a Sparrowhawk and a Short-eared Owl all being seen for the first time this year, while at least 14 Stonechat was a good count for the island. A Water Rail was also seen as were two mating Buzzards at Pigstone Bay. Finally, today (9th) saw the arrival of our first Chiffchaff of the spring, sporting a crust of pollen at the base of its bill, clearly indicating that it was fresh in from warmer southern climes. One of the 14 Stonechats yesterday. We've arrived! The seas looked favourable this morning so we set off on two trips with the boat piled high. 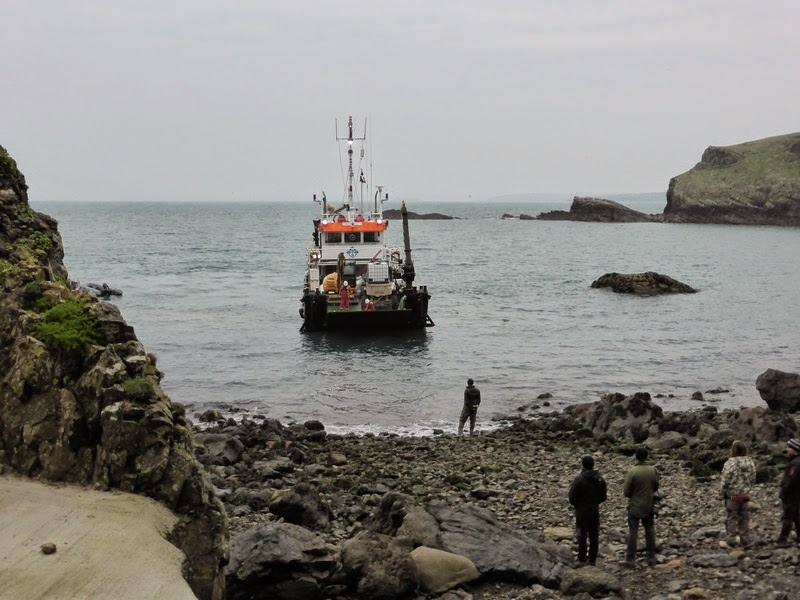 The normal first day checks of the island saw that we have survived the winter well, with no major damage to the island infrastructure, while a further bonus was that the water, gas, electricity and tractor all started with minimal fuss! Over the coming months we’re going to be decorating the buildings, getting the island ready for the season and of course keeping an eye on the nesting birds, which today included seeing a Raven carrying nesting material and many of our cliff-nesting seabirds in attendance on the cliffs. 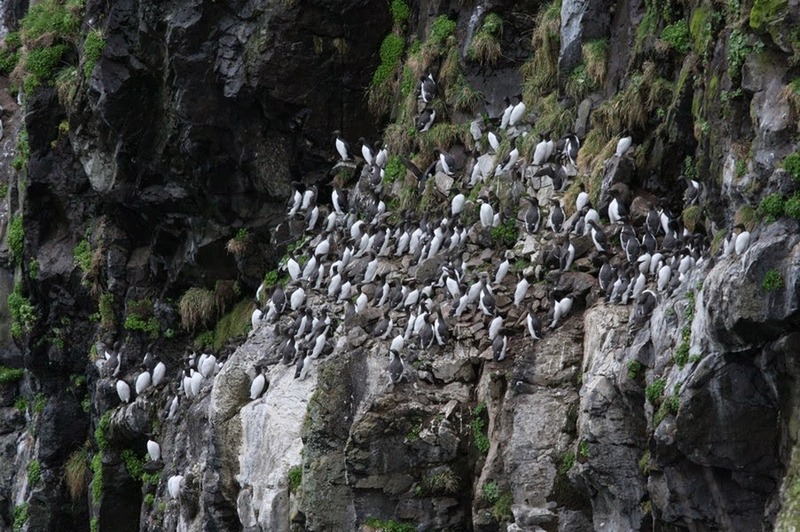 In a little over a months time the Guillemots and Razorbills will be egg laying - exciting times! The best sight to see as we pulled into North Haven this morning was vast rafts of Razorbills and Guillemots and as we walked around the Island it was great to see that the Guillemots, Razorbills, Fulmars and Kittiwake were almost all present and correct on the cliffs, while Lesser Black Backed Gulls were present on the island top. Other notable birds included a Water Rail, 1 Peregrine, 1 Merlin in the Deer Park as we set off, 12 Teal, 5 Snipe and 1 migrant Chaffinch.